Agility is fun sport for dogs and handlers to get fit together. 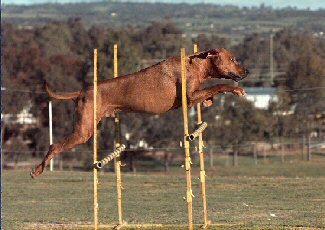 It is the fastest growing of the dog sports and most breeds, from small Terriers to Rhodesian Ridgebacks, are suitable for agility. Dogs are required to negotiate an obstacle course through hoops, tunnels, weaving poles, A frames, dog walks, see saws and jumps within a set time limit. There are five jump height categories and dogs are catalogued to jump either 200 mm, 300mm, 400mm, 500 mm or 600mm based on the height of the dog at the withers. Agility training is offered by most affiliated Clubs and puppies usually start from twelve months of age when their joints and bodies are fully developed. Adult dogs which are fit can commence training at any age. Some affiliated Clubs require dogs to have completed basic obedience training before agility training can commence. Other Clubs will train dogs without any prior obedience training. Document attached under Downloads. In respect to Separate Height Trials. Agility competitions are held most weekends and offer various levels of difficulty from Novice to Masters. Courses are set by the Judges and no two courses are ever the same. The time is calculated by measuring the course length and dividing that by the standard metres per second required for each course level, taking into account the ease or difficulty of the course layout. A ‘clear round’ must be obtained to receive a qualification with no time faults or course faults recorded. Competitions classes include Novice, Excellent, Open and Master Agility and Novice, Excellent, Open and Master Jumping. Titles are awarded at each level of AD, ADX, ADO, ADM, JD, JDX, JDO and JDM. The highest level of achievement is Agility Champion. The Agility Games classes test the handler’s strategic skills and together with a faultless performance from the dog will achieve qualifications in Snooker, Gamblers and Strategic Pairs. Games classes have three levels of difficulty – Novice, Excellent and Master. Titles are awarded at each level. If you are interested in becoming fitter and wish to train your dog in agility or participate in agility trials, please contact your closest affiliated Agility Club which will be pleased to assist you. There are ten affiliated Clubs in South Australia which offer agility training, including the only specialist Club, The Agility Dog Club of SA at West Beach.